If you're looking for a scarf that's just a little bit different, this bias knit scarf is a great option. Working on the bias with a self-striping yarn means your stripes will come out on the diagonal. Because it's skinny Stockinette with a bias, this scarf curls a lot, too, and it's a really fun look. Gauge: Gauge is not critical for this project. It will average 19 stitches and 24 rows per 4 inches (4.75 stitches and 6 rows per inch) in bias Stockinette Stitch. Size: Finished scarf is about 3 inches wide and 6 feet long. 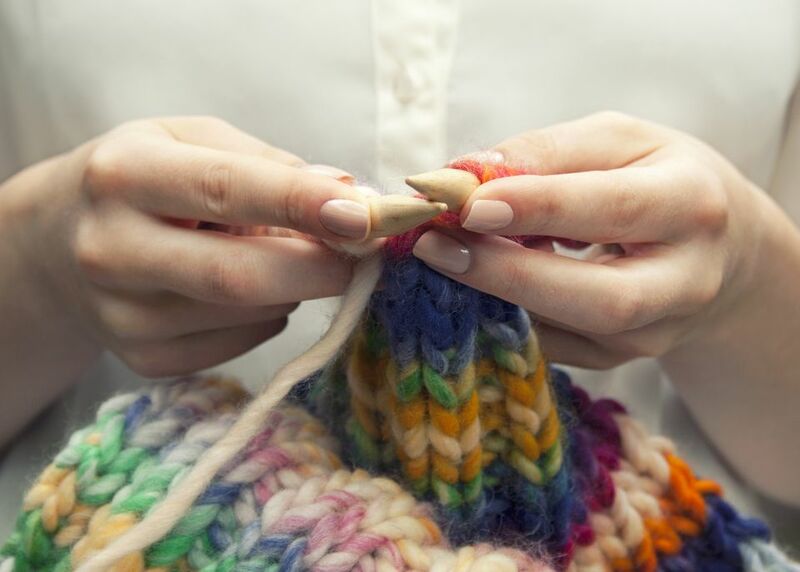 If you're newer to knitting, this is a great project to practice a few new skills. It will teach you how knitting on a bias works as well as the increase stitch known as 'make 1' and give you more practice. Knit 1, make 1, knit to 3 stitches from the end, knit 2 together, knit 1. Repeat these 2 rows until the piece measures 6 feet or length of your choice. Blocking does help take some of the curl out of the scarf, but in time it will corkscrew again. It's part of the look so don't worry too much about it. Knitting on a bias means that you're knitting across a diagonal rather than a straight square-like pattern shape. The increases and decreases on every right side row control this diagonal stitch pattern and it adds a unique, decorative touch to the knitwear. Bias Garter Stitch Square - Knitting in Garter Stitch is one of the most popular ways to work a bias. This simple tutorial will show you two ways to create bias squares, which can be any size you want to make them. Work the increase until the sides are as long as you like, then decrease. Smaller squares can be sewn together for a patchwork scarf and bigger squares can be combined for a comfy afghan or used alone for a quick pillow cover. Bias Doll Blanket - This pattern also features Garter Stitch and unlike the scarf in the pattern above, this stitch avoids the curling without any extra work. Use the doll blanket pattern to quickly see how the bias increases work to create a medium-sized square.